You can click on the links above for a preview of the schedule for the week, with links to more detailed blueprints which will develop during and following UDS. If you’ll be joining us in person, then I’ll see you there! If not, be sure to review Laura’s guide on how to participate remotely. DebConf continued until Saturday, but Friday the 6th was my last day as I left New York that evening. I’m a bit late in getting this summary written up. Marga took a bold look at the challenges facing Debian today. She says that Debian is perceived to be less innovative, out of date, difficult to use, and shrinking as a community. She called out Ubuntu as the “elephant in the room”, which is “‘taking away’ from Debian.” She insists that she is not opposed to Ubuntu, but that nonetheless Ubuntu is to some extent displacing Debian as a focal point for newcomers (both users and contributors). Marga points out that Debian’s work is still meaningful, because many users still prefer Debian, and it is perceived to be of higher quality, as well as being the essential basis for derivatives like Ubuntu. She conducted a survey (about 40 respondents) to ask what Debian’s problems are, and grouped them into categories like “motivation” and “communication” (tied for the #1 spot), “visibility” (#3, meaning public awareness and perception of Debian) and so on. She went on to make some suggestions about how to address these problems. This stimulated a lot of discussion, and most of the remaining time was taken up by comments from the audience. The video has been published, and offers a lot of insight into how Debian developers perceive each other and the project. She also made suggestions for the problems of visibility and motivation. These are crucial issues for Debian devotees to be considering, and I applaud Marga for her fortitude in drawing attention to them. This session was one of the highlights of this DebConf, and catalyzed a lot of discussion of vital issues in Debian. Many people had opinions, and although they agreed on many things, agreement was rarely expressed openly. Sometimes it helps a lot to simply say “I agree with you” and leave it at that. Lending support, rather than adding a new voice, helps to build consensus. People waited for their turn to talk rather than listening to the person speaking, so the discussion didn’t build momentum toward a conclusion. The conversation got louder and more dense over time, making it difficult to enter. It wasn’t argumentative; it was simply loud and fast-paced. This drowned out people who weren’t as vocal or willful. Even where agreement was apparent, there was often no clear action agreed. No one had responsibility for changing the situation. These same patterns are easily observed on Debian mailing lists for the past 10+ years. I exhibited them myself when I was active on these lists. This kind of cultural norm, once established, is difficult to intentionally change. It requires a fairly radical approach, which will inevitably mean coping with loss. In the case of a community, this can mean losing volunteer contributors cannot let go of this norm, and that is an emotionally difficult experience. However, it is nonetheless necessary to move forward, and I think that Debian as a community is capable of moving beyond it. Given my history with both Debian and Ubuntu, I couldn’t help but take a comparative view of some of this. These problems are not new to Debian, and indeed they inspired many of the key decisions we made when founding the Ubuntu project in 2004. We particularly wanted to foster a culture which was supportive, encouraging and welcoming to potential contributors, something Debian has struggled with. Ubuntu has been, quite deliberately, an experiment in finding solutions to problems such as these. We’ve learned a lot from this experiment, and I’ve always hoped that this would help to find solutions for Debian as well. Unfortunately, I don’t think Debian has benefited from these Ubuntu experiments as much as we might have hoped. A common example of this is the Ubuntu Code of Conduct. The idea of a project code of conduct predates Ubuntu, of course, but we did help to popularize it within the free software community, and this is now a common (and successful) practice used by many free software projects. The idea of behavioral standards for Debian has been raised in various forms for years now, but never seems to get traction. Hearing people talk about it at DebConf, it sometimes seemed almost as if the idea was dismissed out of hand because it was too closely associated with Ubuntu. I learned from Marga’s talk that Enrico Zini drafted a set of Debian Community Guidelines over four years ago in 2006. It is perhaps a bit longand structured, but is basically excellent. Enrico has done a great job of compiling best practices for participating in an open community project. However, his document seems to be purely informational, without any official standing in the Debian project, and Debian community leaders have hesitated to make it something more. Perhaps Ubuntu leaders (myself included) could have done more to nurture these ideas in Debian. At least in my experience, though, I found that my affiliation with Ubuntu almost immediately labeled me an “outsider” in Debian, even when I was still active as a developer, and this made it very difficult to make such proposals. Perhaps this is because Debian is proud of its independence, and does not want to be unduly influenced by external forces. Perhaps the initial “growing pains” of the Debian/Ubuntu relationship got in the way. Nonetheless, I think that Debian could be stronger by learning from Ubuntu, just as Ubuntu has learned so much from Debian. I enjoyed this DebConf very much. This was the first DebConf to be hosted in the US, and there were many familiar faces that I hadn’t seen in some time. Columbia University offered an excellent location, and the presentation content was thought-provoking. There seemed to be a positive attitude toward Ubuntu, which was very good to see. Although there is always more work to do, it feels like we’re making progress in improving cooperation between Debian and Ubuntu. I was a bit sad to leave, but was fortunate enough to meet up with Debian folk during my subsequent stay in the Boston area as well. It felt good to reconnect with this circle of friends again, and I hope to see you again soon. Eben’s talk was on the same topic as his Internet Society talk in February, which I had downloaded and watched some time ago. He challenges the free software community to develop the software to power the “freedom box”, a small, efficient and inexpensive personal server. Such a system would put users more in control of their online lives, give them better protection for it under the law, and provide a platform for many new federated services. It sounds like a very interesting project, which I’d like to write more about. Hanna is bringing together her interests in machine learning and free software by using machine learning techniques to analyze of publicly available data from free software communities. In doing so, she hopes to develop tools for studying the patterns of collaboration, innovation and other behavior in these communities. Her methodology uses statistical topic models, which infer the topic of a document based on the occurrence of topical words, to group Debian mailing list posts by topic. Her example analyzed posts from the debian-project and debian-women mailing lists, inferring a set of topics and categorizing all of the posts according to which topic(s) were represented in them. Using this data, she could plot over time the frequency of discussion of each topic, which revealed interesting patterns. The audience quickly zoned in on practical applications for things like flamewar and troll detection. I organized this discussion session to share perspectives on Debian derivatives, in particular how we can improve cooperation between derivatives and Debian itself. The room was a bit hard to find, so attendance was relatively small, but this turned out to be a plus. With a smaller group, we were able to get acquainted with each other, and everyone participated. Unsurprisingly, there were many more representatives from Ubuntu than other derivatives, and I was concerned that Ubuntu would dominate the discussion. It did, but I tried to draw out perspectives from other derivatives where possible. On the whole, the tone was positive and constructive. This may be due in part to people self-selecting for the BoF, but I think there is a lot of genuine goodwill between Debian and Ubuntu. Stefano Zacchiroli took notes in Gobby during the session, which I expect he will post somewhere public when he has a chance. Today was the first day of DebConf proper, where all of the sessions were aimed at project participants. Stefano delivered an excellent address to the Debian project. As Project Leader, he offered a perspective on how far Debian has come, raised some of the key questions facing Debian today, and challenged the project to move forward and improve in several important ways. He asked the audience: Is Debian better than other distributions? Is Debian still relevant? Why/how? A focus on quality, as defined by Debian’s highly modular approach. Each package maintainer is an expert on the software they package, and Debian as a whole offers a superior repository of packages. The principles of software freedom, as embodied in Debian’s Social Contract. The Debian community’s current interpretation is a purist one, and Stefano cited the elimination of non-free firmware as a milestone in the upcoming Squeeze release. I wonder, though, how many of the audience, tapping away on WiFi-connected laptops, were able to do so without such firmware. The project’s independent status, supported by donations and volunteers, which empowers it to make its own decisions, free of external impositions. Debian’s ability to make decisions, as embodied in the constitution. This happens mostly through do-ocracy (individuals are empowered to decide questions concerning their own work), though larger scope issues are decided democratically. This one evoked a bit of a chuckle, as decision making in Debian is not always perceived as fully effective. Developers accepting shared responsibility for the release as a whole. Making one’s own packages ready for release is necessary, but not sufficient. He cited evidence that the culture around NMUs is changing: historically, due to the do-ocratic system mentioned above, Debian developers have been somewhat territorial about their packages, and non-maintainer uploads were seen as stepping on their toes. However, recent experiments have indicated that this may no longer be the case, and Stefano encouraged more developers to help each other through NMUs. When making decisions, we should seek consensus, not unanimity. In a project with thousands of contributors, whose operations are open to the public, there will never be unanimous support for a proposal, and seeking unanimity leads to stalled decisions. In order to gain more contributors, Debian needs to welcome new and inexperienced contributors, as well as users (who can grow into contributors. He suggested reaching out to derivatives to find more of both. He decried the conventional wisdom that a “thick skin” should be a prerequisite for joining the project, pointing out that this attitude simply leads to fewer contributors. This point was met with applause by the DebConf audience. All in all, I thought this was an accurate, timely and inspirational message for the project, and the talk is worth watching for any current or prospective contributor to Debian. Russ facilitated a discussion about the Debian policy document itself and the process for managing it. He has recently put in a lot of time working on the backlog (down from 160+ to 120), but this is not sustainable for him, and help is needed. There was also some discussion in passing of the long-standing confusion (presumably among people new to the project) with regard to how policy is established. In Debian, best practices are first implemented in packages, then documented in policy (not the reverse). Sometimes, improvements are suggested at the policy level, when they need to start elsewhere. I’m not very familiar with how the policy manual is maintained at present, but listening to the discussion, it sounded like it might help to extend the process to include the implementation stage. This would allow standards improvements to be tracked all the way through from concept, to implementation, to documentation. Torsten described the current state of Java packaging in Debian and the general problems involved, including licensing issues, build system challenges (e.g. maven) and dependency management. His slides were information-dense, so I didn’t take a lot of notes. Jorge talked about the connections between Debian and Ubuntu, how people in the projects perceive each other, and how to foster good relationships between developers. He talked about past efforts to quantify collaboration between the projects, but the focus is now on building personal relationships. There were many good questions and comments afterward, and I’m looking forward to the Debian derivatives BoF session tomorrow to get into more detail. Tonight is the traditional wine and cheese party. When this tradition started, I was one of just a handful of people in a room with some cheese and paper plates, but it’s now a large social gathering with contributions of cheese and wine from around the world. I’m looking forward to it. This is a repost from the ubuntu-devel mailing list, where there is probably some discussion happening by now. After each UDS, the organizers evaluate the event and consider how it could be further improved in the future. As a result of this process, the format of UDS has evolved considerably, as it has grown from a smallish informal gathering to a highly structured matrix of hundreds of 45-to-60-minute sessions with sophisticated audiovisual facilities. If you participated in UDS 10.10 (locally or online), you have hopefully already completed the online survey, which is an important part of this evaluation process. A survey can’t tell the whole story, though, so I would also like to start a more free-form discussion here among Ubuntu developers as well. I have some thoughts I’d like to share, and I’m interested in your perspectives as well. The core purpose of UDS has always been to help Ubuntu developers to explore, refine and share their plans for the subsequent release. It has expanded over the years to include all kinds of contributors, not only developers, but the principle remains the same. We arrive at UDS with goals, desires and ideas, and leave with a plan of action which guides our work for the rest of the cycle. This screenshot is only 1600×1200, so there are another 5 columns off the right edge of the screen for a total of 18 rooms. 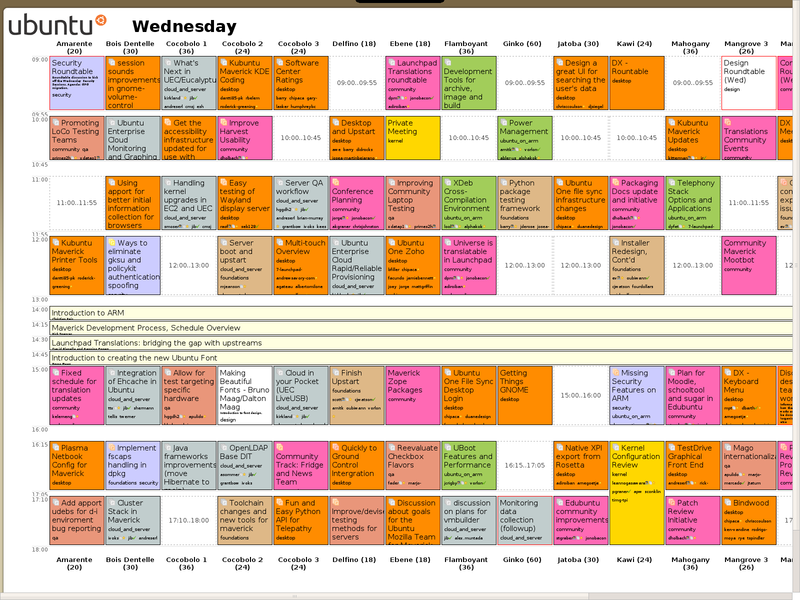 With 7 time slots per day over 5 days, there are over 500 blocks in the schedule grid. 9 tracks are scattered over the grid. We produce hundreds of blueprints representing projects we would like to work on. It is an impressive achievement to pull this event together every six months, and the organizers work very hard at it. We accomplish a great deal at every UDS, and should feel good about that. We must also constantly evaluate how well it is working, and make adjustments to accommodate growth and change in the project. In the beginning, before it was even called UDS, we worked from a rough agenda, adding items as they came up, and ticking them off as we finished talking about them. Ad hoc methods worked pretty well at this scale. As the event grew, and we held more and more discussions in parallel, it was hard to keep track of who was where, and we started to run into contention. Ubuntu and Launchpad were planning their upcoming work together at the same time. One group would be discussing topic A, and find that they needed the participation of person X, who was already involved in another discussion on topic B. The A group would either block, or go ahead without the benefit of person X, neither of which was seen to be very effective. By the end of the week, everyone was mentally and physically exhausted, and many were ill.
As a result, we decided to adopt a schedule grid, and ensure that nobody was expected to be in two places at once. Our productivity depended on getting precisely the right people face to face to tackle the technical challenges we faced. This meant deciding in advance who should be present in each session, and laying out the schedule to satisfy these constraints. New sessions were being added all the time, so the UDS organizers would stay up late at night during the event, creating the schedule grid for the next day. In the morning, over breakfast, everyone would tell them about errors, and request revisions to the schedule. Revisions to the schedule were painful, because we had to re-check all of the constraints by hand. So, in the geek spirit, we developed a program which would read in the constraints and generate an error-free schedule. The UDS organizers ran this at the end of each day during the event, checked it over, and posted it. In the morning, over breakfast, everyone would tell them about constraints they hadn’t been aware of, and request revisions to the schedule. Revisions to the schedule were painful, because a single changed constraint would completely rearrange the schedule. People found themselves running all over the place to different rooms throughout the day, as they were scheduled into many different meetings back-to-back. At around this point, UDS had become too big, and had too many constraints, to plan on the fly (unconference style). We resolved to plan more in advance, and agree on the scheduling constraints ahead of time. We divided the event into tracks, and placed each track in its own room. Most participants could stay in one place throughout the day, taking part in a series of related meetings except where they were specifically needed in an adjacent track. We created the schedule through a combination of manual and automatic methods, so that scheduling constraints could be checked quickly, but a human could decide how to resolve conflicts. There was time to review the schedule before the start of the event, to identify and fix problems. Revisions to the schedule during the event were fewer and less painful. We added keynote presentations, to provide opportunities to communicate important information to everyone, and ease back into meetings after lunch. Everyone was still exhausted and/or ill, and tiredness took its toll on the quality of discussion, particularly toward the end of the week. Concerns were raised that people weren’t participating enough, and might stay on in the same room passively when they might be better able to contribute to a different session happening elsewhere. As a result, the schedule was randomly rearranged so that related sessions would not be held in the same room, and everyone would get up and move at the end of each hour. This brings us roughly to where things stand today. UDS is big and complex. Creating and maintaining the schedule is a lot of work in itself, and this large format requires a large venue, which in turn requires more planning and logistical work (not to mention cost). This is only worthwhile if we get proportionally more benefit out of the event itself. UDS produces many more blueprints than we need for a cycle. While some of these represent an explicit decision not to pursue a project, most of them are set aside simply because we can’t fit them in. We have the capacity to implement over 100 blueprints per cycle, but we have *thousands* of blueprints registered today. We finished less than half of the blueprints we registered for 10.04. This means that we’re spending a lot of time at UDS talking about things which can’t get done that cycle (and may never get done). UDS is (still) exhausting. While we should work hard, and a level of intensity helps to energize us, I think it’s a bit too much. Sessions later in the week are substantially more sluggish than early on, and don’t get the full benefit of the minds we’ve brought together. I believe that such an intense format does not suit the type of work being done at the event, which should be more creative and energetic. The format of UDS is optimized for short discussions (as many as we can fit into the grid). This is good for many technical decisions, but does not lend itself as well to generating new ideas, deeply exploring a topic, building broad consensus or tackling “big picture” issues facing the project. These deeper problems sometimes require more time. They also benefit tremendously from face-to-face interaction, so UDS is our best opportunity to work on them, and we should take advantage of it. UDS sessions aim for the minimum level of participation necessary, so that we can carry on many sessions in parallel: we ask, “who do we need in order to discuss this topic?” This is appropriate for many meetings. However, some would benefit greatly from broader participation, especially from multiple teams. We don’t always know in advance where a transformative idea will come from, and having more points of view represented would be valuable for many UDS topics. Concentrate on the projects we can complete in the upcoming cycle. If we aren’t going to have time to implement something until the next cycle, the blueprint can usually be deferred to the next cycle as well. By producing only moderately more blueprints than we need, we can reduce the complexity of the event, avoid waste, prepare better, and put most of our energy into the blueprints we intend to use in the near future. Group related sessions into clusters, and work on them together, with a similar group of people. By switching context less often, we can more easily stay engaged, get less fatigued, and make meaningful connections between related topics. Organize for cross-team participation, rather than dividing teams into tracks. A given session may relate to a Desktop Edition feature, but depends on contributions from more than just the Desktop Team. There is a lot of design going on at UDS outside of the “Design” track. By working together to achieve common goals, we can more easily anticipate problems, benefit from diverse points of view, and help each other more throughout the cycle. Build in opportunities to work on deeper problems, during longer blocks of time. As a platform, Ubuntu exists within a complex ecosystem, and we need to spend time together understanding where we are and where we are going. As a project, we have grown rapidly, and need to regularly evaluate how we are working and how we can improve. This means considering more than just blueprints, and sometimes taking more than an hour to cover a topic. Starting about a year ago, I started following the release of videos from TED events. If one looked interesting, I would download the video to watch later. In this way, I accumulated a substantial collection of talks which I never managed to watch. I spent a Saturday evening working my way through the list. These are my favorites out of this batch.